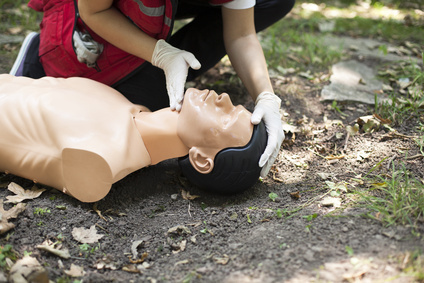 If possible, send someone to activate the Emergency Response System (call 911) and begin CPR immediately. Use an AED if there is one available at the scene. If you’re not with someone and you do not have a mobile phone, leave the patient to activate the Emergency Response System while also retrieving an AED. Scene Safety and Recognition of Cardiac Arrest: Check for safety (for rescuers and victims) and responsiveness, breathing, and gasping. Check the pulse for more than 5 seconds but within 10 seconds (breathing and pulse check can occur simultaneously). Check Pulse: Test the pulse by placing two fingers on the carotid artery. Press your index and 3rd finger on the side of the neck, against the windpipe. You can also check the wrist by placing the same two fingers on the inside of the wrist below the thumb. Circulation: Chest compressions circulate the blood within the patient. It's important to place your hands correctly upon the patient’s chest. Chest Compression Tempo: Perform CPR while matching the tempo of the song "Staying Alive" while making sure to push hard and fast. Make sure the adult or adolescent is resting upon a firm, solid surface. Perform chest compressions on the lower half of the breastbone (sternum). Once in position, lock your elbows and use your body’s weight to compress at least 2 inches (5 cm) upon the patient’s chest. Do not lean on the patient’s chest in between compressions and make sure the chest ultimately recoils. Limit all interruptions to less than 10 seconds while performing CPR. It’s important to note: When performing chest compressions on an adult or adolescent you should compress at least 2 inches (5 cm). The compression rate is 100-120/min. Two Rescuers: Perform tasks simultaneously. Administer compressions over breathing 30:2. Chest Compression Fraction is the total percentage of resuscitation time when performed by the rescuer(s) during cardiac arrest. 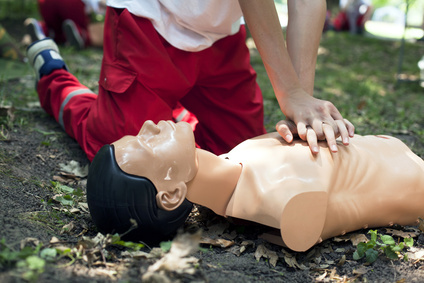 Try to minimize pauses in chest compressions. Chest Compression Fraction Goal: Target of at least 60 percent. Perform continuous compressions at a rate of 100-120/min. Provide one breath every 6 seconds (10 breaths/min). Airway: Make sure the patient is on a solid surface on their back. Kneel next to the patient’s neck and shoulders. Open the patient’s airway by tilting the head back with the palm of one hand while gently lifting the chin with your other hand. For no more than 10 seconds, check for life: listen for any sounds and put your cheek next to the patient’s mouth to feel any breaths while also looking for any motion. Rescuers can check steps simultaneously. If the patient is assumed lifeless, begin mouth-to-mouth. Rescue Breathing: Is widely known to be performed mouth-to-mouth. It can also be performed mouth-to-nose, but this form is only used in rare cases. While still performing the airway technique, pinch the patient’s nose shut. With a complete seal over the patient’s mouth with your mouth, breathe until you see the chest inflate. If the chest does not rise, repeat the airway technique. Once the chest swells, breathe into the patient a second time (30:2). Make sure not to lean on the chest of the victim. Allow full recoil after each chest compression.